Lionel Messi is one of only two players to score eight hat-tricks in the UEFA Champions League. He is also the only player to score four or more goals more than once. Cristiano Ronaldo is the joint record holder for the most Champions League hat-tricks. He is the only player to score three hat-tricks in a single season and the only player to score two consecutive hat-tricks in the knockout stage. Since the inception of the UEFA Champions League in 1992, 89 players from 35 countries have scored three goals (a hat-trick) or more in a single match on a total of 122 occasions for 45 different clubs in 15 different leagues. The first player to achieve the feat was Juul Ellerman, who scored three times for PSV Eindhoven in a 6–0 victory over FK Vilnius on 16 September 1992. Twelve players have scored four or more goals in a match; of these, only Lionel Messi has achieved this more than once. Only Messi (8 March 2012) and Luiz Adriano (21 October 2014) have scored five. The other ten players to score four goals are Marco van Basten, Simone Inzaghi, Dado Pršo, Ruud van Nistelrooy, Andriy Shevchenko, Bafétimbi Gomis, Mario Gómez, Robert Lewandowski, Zlatan Ibrahimović, and Cristiano Ronaldo. Messi and Ronaldo have scored three or more goals eight times in the Champions League, more than any other player, followed by Filippo Inzaghi, Gómez and Luiz Adriano, who have done it on three occasions, while Andy Cole, Michael Owen, Samuel Eto'o, Marco Simone, van Nistelrooy, Roy Makaay, Roberto Soldado, Didier Drogba, Adriano, Shevchenko, Lewandowski, Sergio Agüero, Karim Benzema and Neymar have scored two hat-tricks. Only Ronaldo (four times) and Messi (twice) have scored three or more goals on more than a single occasion in the knock-out round. Eleven of the players have each scored hat-tricks for two or more different clubs: Inzaghi (Juventus and Milan), Owen (Liverpool and Manchester United), Eto'o (Barcelona and Inter Milan), Simone (Milan and Monaco), Van Nistelrooy (PSV Eindhoven and Manchester United), Makaay (Deportivo and Bayern Munich), Shevchenko (Dynamo Kyiv and Milan), Drogba (Marseille and Chelsea), Lewandowski (Borussia Dortmund and Bayern Munich), Neymar (Barcelona and Paris Saint-Germain) and Ronaldo (Real Madrid and Juventus). Seven players have scored a hat-trick on their debut in the Champions League: Marco van Basten (Milan; he is the only player to score four goals on his debut), Faustino Asprilla (Newcastle United), Yakubu (Maccabi Haifa), Wayne Rooney (Manchester United), Vincenzo Iaquinta (Udinese), Grafite (Wolfsburg) and Yacine Brahimi (Porto). Five players have scored hat-tricks in two consecutive seasons: Adriano (for Inter Milan in 2004–05 and 2005–06), Gómez (for Bayern Munich in 2010–11 and 2011–12), Soldado (for Valencia in 2011–12 and 2012–13), Cristiano Ronaldo (for Real Madrid in 2012–13 and 2013–14, and in 2015–16 and 2016–17), and Messi (for Barcelona in 2013–14 and 2014–15). Two players have achieved hat-tricks in back-to-back games. Cristiano Ronaldo did it for Real Madrid against Bayern Munich on 18 April 2017 and Atlético Madrid on 2 May 2017, the shortest gap at just 14 days, and Luiz Adriano did it for Shakhtar Donetsk against BATE Borisov on 21 October and 5 November 2014, a gap of 15 days. The longest spell between two hat-tricks was achieved by Owen, who scored his first hat-trick on 22 October 2002 for Liverpool and his second over seven years later on 8 December 2009 for Manchester United. Cristiano Ronaldo is the only player to score more than two hat-tricks in the same season, having scored three goals for Real Madrid on 15 September 2015, four on 8 December 2015, and another three on 12 April 2016. Two other players have scored hat-tricks in the same season: Messi scored two for Barcelona, the first on 1 November 2011 and the second on 7 March 2012, and Gómez scored a hat-trick for Bayern Munich on 2 November 2011 and another four goals on 13 March 2012. Bafétimbi Gomis holds the record for the quickest Champions League hat-trick, netting three times for French team Olympique Lyonnais against Croatian team Dinamo Zagreb in 7 minutes on 7 December 2011. The record was previously held for 16 years by Mike Newell, who scored a perfect hat-trick for English team Blackburn Rovers against Norwegian team Rosenborg on 6 December 1995 in 9 minutes. The youngest scorer of a Champions League hat-trick was Raúl, who scored a hat-trick for Real Madrid against Ferencváros, aged 18 years and 113 days, on 18 October 1995. Wayne Rooney is the youngest debut scorer of a Champions League hat-trick, aged 18 years and 340 days, when he scored for Manchester United against Fenerbahçe on 28 September 2004. The oldest scorer of a hat-trick in the UEFA Champions League is Cristiano Ronaldo, who was 34 years and 35 days old when he scored for Juventus three times against Atlético Madrid on 12 March 2019. The 2016–17 season holds the record for the most hat-tricks in a season, with nine. Marco van Basten was the first to score four in a Champions League game. Raúl scored a hat-trick aged just 18. Ruud van Nistelrooy scored hat-tricks for PSV Eindhoven and Manchester United. Andriy Shevchenko scored hat-tricks for two teams, both in 4–0 victories. Michael Owen scored hat-tricks eight years apart for rivals Liverpool and Manchester United. 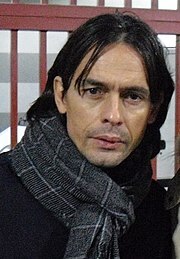 Filippo Inzaghi was the first player to score three hat-tricks. Mario Gómez also scored three hat-tricks, all for Bayern Munich. Bafétimbi Gomis scored the quickest Champions League hat-trick. Luiz Adriano was the first to score back-to-back hat-tricks. ^ "Lionel Messi scores 5 goals in CL". ESPN. 8 March 2012. Archived from the original on 3 January 2014. Retrieved 2 January 2014. ^ "Luiz Adriano the five-goal hero". FourFourTwo. 21 October 2014. Retrieved 21 October 2014. ^ Carr, Paul (18 September 2013). "Messi hat-trick highlights Wednesday action". ESPN. Retrieved 2 January 2014. ^ "All time hat tricks UEFA Champions League". StatBunker. Retrieved 29 September 2015. ^ a b "UEFA Champions League Hat-Tricks from 1992-93 to 2015-16". My Football Facts. Retrieved 29 September 2015. ^ "Champions League Statistics: Most goals by a player per game". World Football. Retrieved 21 March 2014. ^ "All you ever wanted to know: Champions League hat-tricks". UEFA. 3 October 2018. ^ Mohamed, Majid (7 January 2013). "Barcelona's Lionel Messi becomes most decorated player in history after winning unprecedented fourth straight Ballon d'Or". The Independent. Retrieved 2 January 2014. ^ Holden, Kit (20 March 2012). "What might have been had Mario Gómez left Bayern Munich for Liverpool?". The Independent. Archived from the original on 2 November 2013. Retrieved 2 January 2014. ^ "Gomis usurps Newell with fastest hat-trick". Four Four Two. 7 December 2011. Retrieved 2 January 2014. ^ "Bafetimbi Gomis scores four goals to stun Dinamo Zagreb". BBC. 7 December 2011. Retrieved 2 January 2014. ^ Kay, Alex (7 April 2010). "Lionel Messi's hat-trick was world class but mine is still fastest ever in Champions League, says Mike Newell". Daily Mail. Retrieved 2 January 2014. ^ "Man Utd 6-2 Fenerbahce". BBC. 28 September 2004. Retrieved 21 March 2014. ^ "UEFA Champions League hat-trick records". UEFA.com. Union of European Football Associations. 18 November 2016. Retrieved 9 April 2018. ^ "UEFA Champions League 1992/93 - History - PSV-FK Žalgiris Vilnius". UEFA.com. Union of European Football Associations. 16 September 1992. Retrieved 2 January 2014. ^ "UEFA Champions League 1992/93 - History - PSV-AEK". UEFA.com. Union of European Football Associations. 4 November 1992. Retrieved 2 January 2014. ^ "UEFA Champions League 1992/93 - History - Milan-Göteborg". UEFA.com. Union of European Football Associations. 25 November 1992. Retrieved 2 January 2014. ^ "UEFA Champions League 1992/93 - History - Marseille-CSKA Moskva". UEFA.com. Union of European Football Associations. 17 March 1993. Retrieved 2 January 2014. ^ "UEFA Champions League 1993/94 - History - Skonto-Spartak Moskva". UEFA.com. Union of European Football Associations. 15 September 1993. Retrieved 2 January 2014. ^ "UEFA Champions League 1993/94 - History - Bremen-Dinamo Minsk". UEFA.com. Union of European Football Associations. 16 September 1993. Retrieved 2 January 2014. ^ "UEFA Champions League 1993/94 - History - Anderlecht-HJK". UEFA.com. Union of European Football Associations. 29 September 1993. Retrieved 2 January 2014. ^ "UEFA Champions League 1995/96 - History - Ferencváros-Ajax". UEFA.com. Union of European Football Associations. 27 September 1995. Retrieved 2 January 2014. ^ "UEFA Champions League 1995/96 - History - Real Madrid-Ferencváros". UEFA.com. Union of European Football Associations. 18 October 1995. Retrieved 2 January 2014. ^ "UEFA Champions League 1995/96 - History - Blackburn-Rosenborg". UEFA.com. Union of European Football Associations. 6 December 1995. Retrieved 2 January 2014. ^ "UEFA Champions League 1996/97 - History - Rosenborg-Milan". UEFA.com. Union of European Football Associations. 25 September 1996. Retrieved 2 January 2014. ^ "UEFA Champions League 1997/98 - History - Newcastle-Barcelona". UEFA.com. Union of European Football Associations. 16 September 1997. Retrieved 2 January 2014. ^ "UEFA Champions League 1997/98 - History - Barcelona-Dynamo Kyiv". UEFA.com. Union of European Football Associations. 5 November 1997. Retrieved 2 January 2014. ^ "UEFA Champions League 1997/98 - History – Feyenoord-Man. United". UEFA.com. Union of European Football Associations. 5 November 1997. Retrieved 2 January 2014. ^ "UEFA Champions League 1997/98 - History - Dynamo Kyiv-Juventus". UEFA.com. Union of European Football Associations. 18 March 1998. Retrieved 2 January 2014. ^ "UEFA Champions League 1997/98 - History - Juventus-Monaco". UEFA.com. Union of European Football Associations. 1 April 1992. Retrieved 2 January 2014. ^ "UEFA Champions League 1998/99 - History - Rosenborg- Galatasaray". UEFA.com. Union of European Football Associations. 21 October 1998. Retrieved 2 January 2014. ^ "UEFA Champions League 1998/99 - History - HJK-PSV". UEFA.com. Union of European Football Associations. 25 November 1998. Retrieved 2 January 2014. ^ "UEFA Champions League 1998/99 - History - Kaiserslautern-HJK". UEFA.com. Union of European Football Associations. 9 December 1992. Retrieved 2 January 2014. ^ "UEFA Champions League 1999/00 - History - Willem II-Spartak Moskva". UEFA.com. Union of European Football Associations. 15 September 1999. Retrieved 2 January 2014. ^ "UEFA Champions League 1999/00 - History - Lazio-Marseille". UEFA.com. Union of European Football Associations. 4 March 2000. Retrieved 2 January 2014. ^ "UEFA Champions League 1999/00 - History - Valencia-Lazio". UEFA.com. Union of European Football Associations. 5 April 2000. Retrieved 2 January 2014. ^ "UEFA Champions League 2000/01 - History - Man United- Anderlecht". UEFA.com. Union of European Football Associations. 13 September 2000. Retrieved 2 January 2014. ^ "UEFA Champions League 2000/01 - History - Hamburg-Juventus". UEFA.com. Union of European Football Associations. 13 September 2000. Retrieved 2 January 2014. ^ "UEFA Champions League 2000/01 - History - Rosenborg- Helsingborg". UEFA.com. Union of European Football Associations. 16 September 2000. Retrieved 2 January 2014. ^ "UEFA Champions League 2000/01 - History - Monaco-Sturm". UEFA.com. Union of European Football Associations. 27 September 2000. Retrieved 2 January 2014. ^ "UEFA Champions League 2000/01 - History - Milan-Barcelona". UEFA.com. Union of European Football Associations. 18 October 1992. Retrieved 2 January 2014. ^ "UEFA Champions League 2000/01 - History - Lazio- Shakhtar Donetsk". UEFA.com. Union of European Football Associations. 25 October 1992. Retrieved 2 January 2014. ^ "UEFA Champions League 2000/01 - History - Deportivo-PSG". UEFA.com. Union of European Football Associations. 7 March 2001. Retrieved 2 January 2014. ^ "UEFA Champions League 2002/03 - History - Olympiacos-Leverkusen". UEFA.com. Union of European Football Associations. 18 September 2002. Retrieved 2 January 2014. ^ "UEFA Champions League 2002/03 - History - Bayern-Deportivo". UEFA.com. Union of European Football Associations. 18 September 2002. Retrieved 2 January 2014. ^ "UEFA Champions League 2002/03 - History - Deportivo-Milan". UEFA.com. Union of European Football Associations. 24 September 2004. Retrieved 2 January 2014. ^ "UEFA Champions League 2002/03 - History - M. Haifa- Olympiacos". UEFA.com. Union of European Football Associations. 24 September 2004. Retrieved 2 January 2014. ^ "UEFA Champions League 2002/03 - History - Spartak Moskva-Liverpool". UEFA.com. Union of European Football Associations. 22 October 2002. Retrieved 2 January 2014. ^ "UEFA Champions League 2002/03 - History - Roma-Arsenal". UEFA.com. Union of European Football Associations. 27 November 2002. Retrieved 2 January 2014. ^ "UEFA Champions League 2002/03 - History - Newcastle-Leverkusen". UEFA.com. Union of European Football Associations. 26 February 2003. Retrieved 2 January 2014. ^ "UEFA Champions League 2002/03 - History - Man. United-Real Madrid". UEFA.com. Union of European Football Associations. 23 April 2003. Retrieved 2 January 2014. ^ "UEFA Champions League 2003/04 - History - Marseille-Partizan". UEFA.com. Union of European Football Associations. 1 October 2003. Retrieved 2 January 2014. ^ "UEFA Champions League 2003/04 - History - Monaco-Deportivo". UEFA.com. Union of European Football Associations. 5 November 2003. Retrieved 2 January 2014. ^ "UEFA Champions League 2004/05 - History - Bayern-Ajax". UEFA.com. Union of European Football Associations. 28 September 2004. Retrieved 2 January 2014. ^ "UEFA Champions League 2004/05 - History - Man. United-Fenerbahçe". UEFA.com. Union of European Football Associations. 28 September 2004. Retrieved 2 January 2014. ^ "UEFA Champions League 2004/05 - History - Bremen-Anderlecht". UEFA.com. Union of European Football Associations. 2 November 2004. Retrieved 21 March 2014. ^ "UEFA Champions League 2004/05 - History - Man. United-Sparta Praha". UEFA.com. Union of European Football Associations. 3 November 2004. Retrieved 2 January 2014. ^ "UEFA Champions League 2004/05 - History - Paris-CSKA Moskva". UEFA.com. Union of European Football Associations. 7 December 2004. Retrieved 21 March 2014. ^ "UEFA Champions League 2004/05 - History – Fenerbahçe-Man. United". UEFA.com. Union of European Football Associations. 8 December 2004. Retrieved 2 January 2014. ^ "UEFA Champions League 2004/05 - History - Lyon-Bremen". UEFA.com. Union of European Football Associations. 8 March 2005. Retrieved 2 January 2014. ^ "UEFA Champions League 2004/05 - History - Internazionale-Porto". UEFA.com. Union of European Football Associations. 15 March 2005. Retrieved 2 January 2014. ^ "UEFA Champions League 2005/06 - History - Udinese-Panathinaikos". UEFA.com. Union of European Football Associations. 14 September 2005. Retrieved 2 January 2014. ^ "UEFA Champions League 2005/06 - History - Barcelona-Udinese". UEFA.com. Union of European Football Associations. 27 September 2005. Retrieved 2 January 2014. ^ "UEFA Champions League 2005/06 - History - Barcelona-Panathinaikos". UEFA.com. Union of European Football Associations. 2 November 2005. Retrieved 2 January 2014. ^ "UEFA Champions League 2005/06 - History - Fenerbahçe-Milan". UEFA.com. Union of European Football Associations. 23 November 2005. Retrieved 2 January 2014. ^ "UEFA Champions League 2005/06 - History - Internazionale-Petržalka". UEFA.com. Union of European Football Associations. 23 November 2005. Retrieved 2 January 2014. ^ "UEFA Champions League 2005/06 - History - Schalke-PSV". UEFA.com. Union of European Football Associations. 23 November 2005. Retrieved 2 January 2014. ^ "UEFA Champions League 2006/07 - History - Olympiacos-Valencia". UEFA.com. Union of European Football Associations. 12 September 2006. Retrieved 2 January 2014. ^ "UEFA Champions League 2006/07 - History - Levski-Chelsea". UEFA.com. Union of European Football Associations. 27 September 2006. Retrieved 2 January 2014. ^ "UEFA Champions League 2006/07 - History - Milan-Anderlecht". UEFA.com. Union of European Football Associations. 1 November 2006. Retrieved 2 January 2014. ^ "UEFA Champions League 2007/08 - History - Liverpool-Beşiktaş". UEFA.com. Union of European Football Associations. 6 November 2007. Retrieved 2 January 2014. ^ "UEFA Champions League 2008/09 - History - Villarreal-AaB". UEFA.com. Union of European Football Associations. 21 October 1992. Retrieved 2 January 2014. ^ "UEFA Champions League 2008/09 - History - Shakhtar Donetsk- Basel". UEFA.com. Union of European Football Associations. 26 November 2008. Retrieved 2 January 2014. ^ "UEFA Champions League 2009/10 - History – Wolfsburg-CSKA Moskva". UEFA.com. Union of European Football Associations. 15 September 2009. Retrieved 2 January 2014. ^ "UEFA Champions League 2009/10 - History – Wolfsburg-Man. United". UEFA.com. Union of European Football Associations. 8 December 2009. Retrieved 2 January 2014. ^ "UEFA Champions League 2009/10 - History - Arsenal-Porto". UEFA.com. Union of European Football Associations. 9 March 2010. Retrieved 2 January 2014. ^ "UEFA Champions League 2009/10 - History - Barcelona-Arsenal". UEFA.com. Union of European Football Associations. 6 April 2010. Retrieved 2 January 2014. ^ "UEFA Champions League 2009/10 - History - Lyon-Bayern". UEFA.com. Union of European Football Associations. 27 April 2010. Retrieved 2 January 2014. ^ "UEFA Champions League 2010/11 - History - Internazionale-Bremen". UEFA.com. Union of European Football Associations. 29 September 2010. Retrieved 2 January 2014. ^ "UEFA Champions League 2010/11 - History - Internazionale-Tottenham". UEFA.com. Union of European Football Associations. 20 October 2010. Retrieved 2 January 2014. ^ "UEFA Champions League 2010/11 - History - Žilina-Marseille". UEFA.com. Union of European Football Associations. 3 November 2010. Retrieved 2 January 2014. ^ "UEFA Champions League 2010/11 - History - CFR Cluj-Bayern". UEFA.com. Union of European Football Associations. 3 November 2010. Retrieved 2 January 2014. ^ "UEFA Champions League 2010/11 - History - Real Madrid-Auxerre". UEFA.com. Union of European Football Associations. 8 December 2010. Retrieved 2 January 2014. ^ "UEFA Champions League 2011/12 - History - Plzeň-Barcelona". UEFA.com. Union of European Football Associations. 1 November 2011. Retrieved 2 January 2014. ^ "UEFA Champions League 2011/12 - History - Bayern-Napoli". UEFA.com. Union of European Football Associations. 2 November 2011. Retrieved 2 January 2014. ^ "UEFA Champions League 2011/12 - History - Valencia-Genk". UEFA.com. Union of European Football Associations. 23 November 2011. Retrieved 26 February 2014. ^ "UEFA Champions League 2011/12 - History - Dinamo Zagreb-Lyon". UEFA.com. Union of European Football Associations. 7 December 2011. Retrieved 2 January 2014. ^ "UEFA Champions League 2011/12 - History - Barcelona-Leverkusen". UEFA.com. Union of European Football Associations. 7 March 2012. Retrieved 2 January 2014. ^ "UEFA Champions League 2011/12 - History - Bayern-Basel". UEFA.com. Union of European Football Associations. 13 March 2012. Retrieved 2 January 2014. ^ "UEFA Champions League 2012/13 - History - Ajax-Real Madrid". UEFA.com. Union of European Football Associations. 3 October 2012. Retrieved 2 January 2014. ^ "UEFA Champions League 2012/13 - History - BATE-Valencia". UEFA.com. Union of European Football Associations. 23 October 2012. Retrieved 2 January 2014. ^ "UEFA Champions League 2012/13 - History - Bayern-LOSC". UEFA.com. Union of European Football Associations. 7 November 2012. Retrieved 2 January 2014. ^ "UEFA Champions League 2012/13 - History - CFR Cluj-Galatasaray". UEFA.com. Union of European Football Associations. 7 November 2012. Retrieved 2 January 2014. ^ "UEFA Champions League 2012/13 - History - CFR Cluj-Braga". UEFA.com. Union of European Football Associations. 20 November 2012. Retrieved 2 January 2014. ^ "UEFA Champions League 2012/13 - History - Nordsjælland- Shakhtar Donetsk". UEFA.com. Union of European Football Associations. 20 November 2012. Retrieved 2 January 2014. ^ "UEFA Champions League 2012/13 - History - Dortmund-Real Madrid". UEFA.com. Union of European Football Associations. 24 April 2013. Retrieved 2 January 2014. ^ "UEFA Champions League 2013/14 - History - Real Madrid- Galatasaray". UEFA.com. Union of European Football Associations. 17 September 2013. Retrieved 2 January 2014. ^ "UEFA Champions League 2013/14 - History - Barcelona-Ajax". UEFA.com. Union of European Football Associations. 18 September 2013. Retrieved 2 January 2014. ^ "UEFA Champions League 2013/14 - History - Anderlecht- Olympiacos". UEFA.com. Union of European Football Associations. 2 October 2013. Retrieved 2 January 2014. ^ "UEFA Champions League 2013/14 - History - Anderlecht-Paris". UEFA.com. Union of European Football Associations. 23 October 2013. Retrieved 2 January 2014. ^ "UEFA Champions League 2013/14 - History - Man. City-CSKA Moskva". UEFA.com. Union of European Football Associations. 5 November 2013. Retrieved 2 January 2014. ^ "UEFA Champions League 2013/14 - History - Juventus-Køpenhagen". UEFA.com. Union of European Football Associations. 27 November 2013. Retrieved 2 January 2014. ^ "UEFA Champions League 2013/14 - History - Barcelona-Celtic". UEFA.com. Union of European Football Associations. 11 December 2013. Retrieved 2 January 2014. ^ "UEFA Champions League 2013/14 - History - Man. United-Olympiacos". UEFA.com. Union of European Football Associations. 19 March 2014. Retrieved 19 March 2014. ^ "UEFA Champions League 2014/15 - History - Porto-BATE". UEFA.com. Union of European Football Associations. 17 September 2014. Retrieved 17 September 2014. ^ "UEFA Champions League 2014/15 - History - Arsenal-Galatasaray". UEFA.com. Union of European Football Associations. 1 October 2014. Retrieved 1 October 2014. ^ "UEFA Champions League 2014/15 - History - BATE-Shakhtar". UEFA.com. Union of European Football Associations. 21 October 2014. Retrieved 21 October 2014. ^ "UEFA Champions League 2014/15 - History - Shakhtar-BATE". UEFA.com. Union of European Football Associations. 5 November 2014. Retrieved 5 November 2014. ^ "UEFA Champions League 2014/15 - History - APOEL-Barcelona". UEFA.com. Union of European Football Associations. 25 November 2014. Retrieved 25 November 2014. ^ "UEFA Champions League 2014/15 - History - Man. City-Bayern". UEFA.com. Union of European Football Associations. 25 November 2014. Retrieved 25 November 2014. ^ "UEFA Champions League 2014/15 - History - Atletico-Olympiacos". UEFA.com. Union of European Football Associations. 26 November 2014. Retrieved 26 November 2014. ^ "UEFA Champions League 2015/16 - History - Real Madrid - FC Shakhtar". UEFA.com. Union of European Football Associations. 15 September 2015. Retrieved 15 September 2015. ^ "UEFA Champions League 2015/16 - History - Bayern - Dinamo Zagreb". UEFA.com. Union of European Football Associations. 29 September 2015. Retrieved 29 September 2015. ^ "UEFA Champions League 2015/16 - History - Real Madrid - Malmö FF". UEFA.com. Union of European Football Associations. 8 December 2015. Retrieved 8 December 2015. ^ "UEFA Champions League 2015/16 - History - Olympiacos - Arsenal". UEFA.com. Union of European Football Associations. 9 December 2015. Retrieved 9 December 2015. ^ "UEFA Champions League 2015/16 - History - Real Madrid - Wolfsburg". UEFA.com. Union of European Football Associations. 12 April 2016. Retrieved 12 April 2016. ^ "UEFA Champions League 2016/17 - History - Barcelona - Celtic". UEFA.com. Union of European Football Associations. 13 September 2016. Retrieved 13 September 2016. ^ "UEFA Champions League 2016/17 - History - Manchester City - Borussia Mönchengladbach". UEFA.com. Union of European Football Associations. 14 September 2016. Retrieved 14 September 2016. ^ "UEFA Champions League 2016/17 - History - Barcelona - Manchester City". UEFA.com. Union of European Football Associations. 19 October 2016. Retrieved 19 October 2016. ^ "UEFA Champions League 2016/17 - History - Arsenal - Ludogorets". UEFA.com. Union of European Football Associations. 19 October 2016. Retrieved 19 October 2016. ^ "UEFA Champions League 2016/17 - History - Basel - Arsenal". UEFA.com. Union of European Football Associations. 6 December 2016. Retrieved 6 December 2016. ^ "UEFA Champions League 2016/17 - History - Barcelona - Borussia Mönchengladbach". UEFA.com. Union of European Football Associations. 6 December 2016. Retrieved 6 December 2016. ^ "UEFA Champions League 2016/17 - History - Borussia Dortmund - Benfica". UEFA.com. Union of European Football Associations. 8 March 2017. Retrieved 8 March 2017. ^ "UEFA Champions League 2016/17 - History - Real Madrid - Bayern Munich". UEFA.com. Union of European Football Associations. 18 April 2017. Retrieved 18 April 2017. ^ "UEFA Champions League 2016/17 - History - Real Madrid - Atlético Madrid". UEFA.com. Union of European Football Associations. 2 May 2017. Retrieved 2 May 2017. ^ "UEFA Champions League 2017/18 - History - Tottenham Hotspur - APOEL". UEFA.com. Union of European Football Associations. 26 September 2017. Retrieved 26 September 2017. ^ "UEFA Champions League 2017/18 - History - Sevilla - Maribor". UEFA.com. Union of European Football Associations. 26 September 2017. Retrieved 26 September 2017. ^ "UEFA Champions League 2017/18 - History - PSG - Anderlecht". UEFA.com. Union of European Football Associations. 31 October 2017. Retrieved 31 October 2017. ^ "UEFA Champions League 2017/18 - History - Liverpool - Spartak Moscow". UEFA.com. Union of European Football Associations. 6 December 2017. Retrieved 6 December 2017. ^ "UEFA Champions League 2017/18 - History - Porto - Liverpool". UEFA.com. Union of European Football Associations. 14 February 2018. Retrieved 14 February 2018. ^ "UEFA Champions League 2018/19 - History - Barcelona - PSV". UEFA.com. Union of European Football Associations. 18 September 2018. Retrieved 18 September 2018. ^ "UEFA Champions League - Juventus-Young Boys". UEFA.com. Union of European Football Associations. 2 October 2018. Retrieved 2 October 2018. ^ "UEFA Champions League - Roma-Plzeň". UEFA.com. Union of European Football Associations. 2 October 2018. Retrieved 2 October 2018. ^ "UEFA Champions League - Paris-Crvena zvezda". UEFA.com. Union of European Football Associations. 3 October 2018. Retrieved 3 October 2018. ^ "UEFA Champions League - Man. City-Shakhtar Donetsk". UEFA.com. Union of European Football Associations. 7 November 2018. Retrieved 7 November 2018. ^ "UEFA Champions League - Juventus-Atlético Madrid". UEFA.com. Union of European Football Associations. 12 March 2019. Retrieved 12 March 2019.